Risk is the chance of something going wrong, and the danger that damage or loss will occur, whereas risk management is the process of analysing exposure to risk and determining how best to then handle such exposure. Risk mitigation means that you do something about it. By its very nature, there are both rewards and risks associated with intellectual property (IP). This paper explores the IP Risk Management process and how the right system or tool can help underpin this process. IP risk mitigation is about ensuring that the business really understands its IP related risks, and then mitigates pro-actively. The rationale for this may be driven by the need for freedom to use technologies already in use or being considered for use in the company’s products, but there are many other reasons why businesses need to take IP risk mitigation seriously. The focus should be on risk mitigation and not just of risk evaluation. Risk mitigation covers efforts taken to reduce either the probability or consequences of a threat. Risk mitigation efforts may range from physical measures to financial measures. A process is an interrelated set of activities designed to transform inputs into outputs, which should accomplish your pre-defined business objectives. Processes produce an output of value, they very often span across organisational and functional boundaries and they exist whether you choose to document them or not. A process can be seen as an agreement to do certain things in a certain way and the larger your organisation, the greater the need for agreements on ways of working. Processes are the memory of your organisation, and without them a lot of effort can be wasted by starting every procedure and process from scratch each time and possibly repeating the same mistakes. There are a variety of IP risk mitigation techniques available, but of course their effectiveness will vary from one business to another. It is important that a company builds up a good understanding and appreciation of the various IP solutions which exist, and if and when they should be deployed. With Awareness and Governance being like the bookends, keeping everything else in proper order. That said, a good IP Risk Management System helps ensure that the process is an efficient and effective one. It can improve data integrity as well as better support how IP risks are articulated and reported. 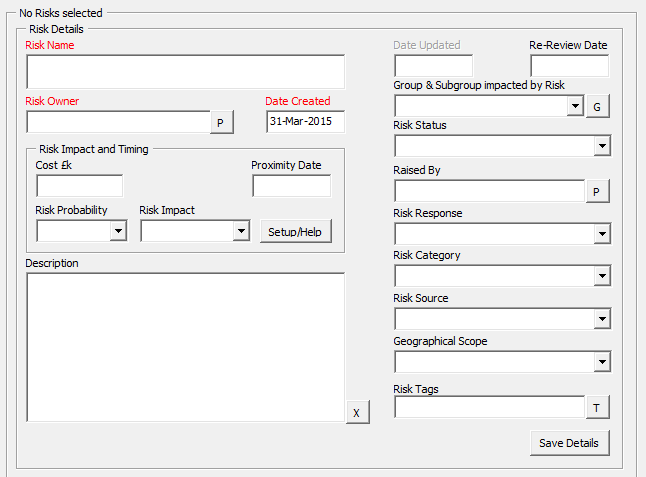 A Risk Management Tool is commonly used in business in such areas as project management and organisational risk assessments. 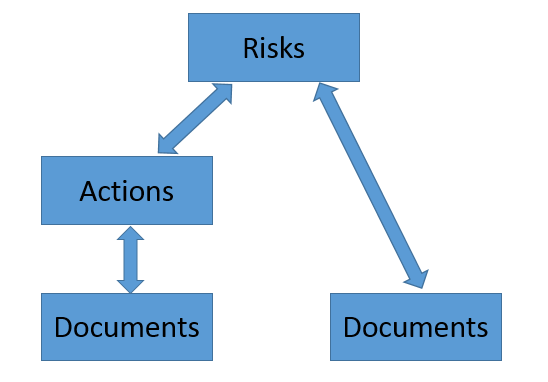 It acts as a central repository for all risks identified and, for each risk, includes information such as risk probability, impact, counter-measures, and risk owner and so on. It can sometimes be referred to as a 'risk register' or 'risk log'. An IP Risk Management Tool is no different and is an essential tool to be able to manage this particular risk area. It initially provides a way to articulate the various IP related risks in a very structured manner. It then acts as an important tool for the ongoing management of these IP risks. 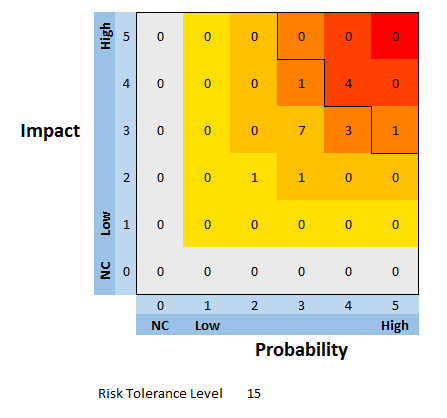 In a "qualitative" risk tool descriptive terms are used: for example a risk might have a "High" impact and a "Medium" probability. In a "quantitative" risk tool the descriptions are enumerated: for example a risk might have a "$1 Million" impact and a "50%" probability. The skills needed to succeed with IP risk mitigation do not match exactly those needed to be successful with the other key IP processes, such as IP creation, IP portfolio management, IP exploitation and IP enforcement. The mind-set is just different for those charged with IP risk mitigation. Finally it is important not to underestimate or exaggerate the risks associated with IP. As IP relates to innovation and creativity, it can sometimes be an emotive subject and some care is needed. Readers might want to add some further bullet-points and observations of their own, providing an even more useful asset for anyone coming to the subject for the first time or seeking to improve an existing perspective on it.